Test your student's knowledge of famous people in U.S. history with a quick quiz. He'll need to match up each notable person with his/her accomplishments. This is a great way to learn about some important landmarks in our nation's history during the westward expansion. Test your scholar’s knowledge of our government system with a fill in the blanks diagram. Use the graphic organizer to reflect on the three main branches of government, and the parts that make up each branch. 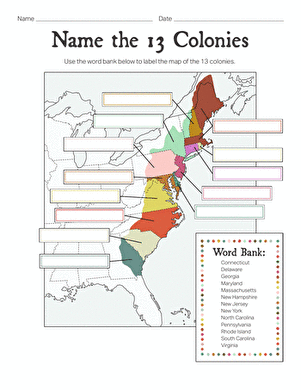 On this worksheet, kids read about this important historical document and complete the sentences using what they learned. Meet Squanto, a man said to have shared his knowledge with the Pilgrims to help them survive in a new land. Give your child a jump start on some essential algebra skills! She'll be simplifying algebraic expressions with these practise problems. How well do you know your country's flag? Now your child can learn about the history of the American flag with this great printable. Here's a mnemonic device to remember all 50 U.S. States. With the map as a cue, first see how many of the United States you can remember.